BD Pathway 855 High Content Screening Confocal Widefield Live Cell Drug Dispense . New Life Scientific, Inc. The Becton Dickinson Pathway high-content confocal imager uses a combination of metal halide lamps, 16-excitation filters, laser autofocus, and Nipkow disk technology to reduce noise and light pollution for live-cell imaging. 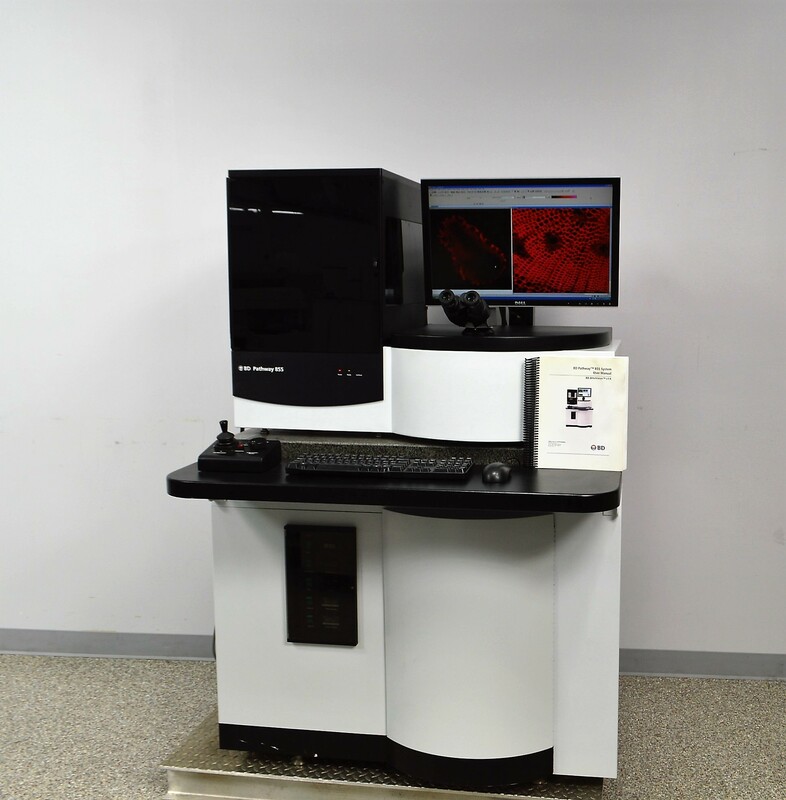 This system is capable of distinguishing sub-cellular features with pre-defined scripts (parameters and macro applications) and providing endpoint and kinetic image data. The 24” workstation monitor or binocular eyepiece can be used for live observation and the chamber contains a liquid handling system with environmental controls. At a capture rate of four images per second, this system uses tiling (multiple adjacent images) for larger images with seamless motion along the x,y,z axes. The stage can accommodate 96 and 384 well-plates, microscope slides, and chamber slides. The BD Pathway 855 has multiple imaging modes for all your bioscience needs including confocal fluorescence, widefield, and brightfield imaging. This Pathway 855 confocal fluorescence imager is in excellent cosmetic condition with minimal signs of wear from relocation and use. New Life Scientific technicians have evaluated this instrument for functionality and confirmed that its optics are functional. NLS acquired three dongles that pair with the software. The environmental controls produced heat, but the dispensing function was not tested. The mechanical integrity of the instrument is in good condition with no signs of damage or fault. The joystick responds and the lights illuminate, the camera captures live images, and the filters adjust. There is one Olympus objective installed in the imager. For more information about the evaluation performed on this instrument, please contact New Life Scientific.